At age nine, Mary was diagnosed with chronic kidney disease and doctors told her parents that she only had six months to live. This was in the early 1970s in Wisconsin when children did not receive dialysis; dialysis was a daylong treatment. At this time, children did not receive kidney transplants either. The best they could do is keep her comfortable and hope for a miracle. The first signs that something was wrong with Mary were at school. The teachers complained to Mary's parents about her falling asleep in class and not wanting to play outside at recess. The teachers thought she was just bored, but her parents knew that did not sound like Mary. She loved school. So, they took her to the doctor, and she was immediately admitted to the local community hospital. Mary began to retain fluid, she could hardly walk and became deathly ill. She was transferred to the University of Wisconsin's Children's Hospital in Madison where more tests were done including a kidney biopsy, and after many lab tests it was discovered that her kidneys were failing. Click the blue button to read more. Do you need a kidney friendly recipe your child will love? 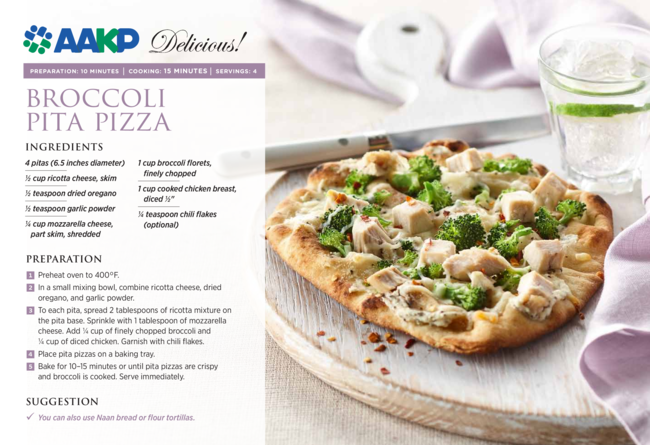 Click the image above to get our Broccoli Pita Pizza recipe. Purchase the full set of recipe cards, by clicking here. Although Boston Children's Hospital remains the nation's No. 1 pediatric hospital, Children's Mercy in Kansas City scored higher marks this year, according to the annual ranking of the top pediatric care centers by U.S. News & World Report. The Kansas City-based children's hospital did not make the honor roll of the top 10 U.S. children's hospitals, but it did rank in the top 50 for all 10 specialties the report measured. In particular, Children's Mercy advanced in two specialties: cardiology and nephrology. The hospital ranked fifth nationwide for nephrology, or the treatment of kidney disease, where it is partnering with the Children's Hospital of Philadelphia to lead a large, national study of chronic kidney disease. Last year, Children's Mercy ranked seventh in the nation for nephrology. Click the blue button to read the full article. Click on the article titles to read these amazing stories. Do you have an inspiring story? Share it with AAKP by clicking below. The tiny cluster of cells floating in a culture dish in pediatric nephrologist Samir El-Dahr's lab is about as big as a sesame seed. The stem cells have been incubating for about 18 days in a pool of nutrients to form the beginnings of a kidney. El-Dahr, MD, and his research team are coaxing them to develop into an organoid, a miniature organ in vitro with the same structure and function of a kidney, but at a much smaller scale. "It's almost the size of a pinhead right now when we grow it," says El-Dahr, chair of the Department of Pediatrics and Jane B. Aron Professor. "But it has all the elements of nephrons in it." El-Dahr is leading a $1.4 million study funded by the National Institutes of Health to characterize the epigenome of stem cells to find a more effective way to reprogram them to differentiate into progenitors of kidney cells. Ultimately, the goal is to figure out how to grow a fully developed kidney that's viable for transplantation.